Sixty miles below Hoover Dam, the smaller Davis Dam (200 feet high) was completed in 1955 forming Lake Mohave, and this also lies within the Lake Mead National Recreation Area, together with large areas of barren, road less desert at either side. The only part that receives much visitation is the southern tip, around the dam, which is just north of the adjacent, fast growing riverside towns of Bullhead City in Arizona and Laughlin, a gambling resort in Nevada. Surface Area: 44 square miles; Length: 67 miles; Maximum Lake Elevation: 647 feet; Capacity: 1,818,300 acre-feet. Building restrictions: Lake Mohave is controlled by the National Park Service. Building in the city on the Colorado River is controlled by the City of Bullhead City. 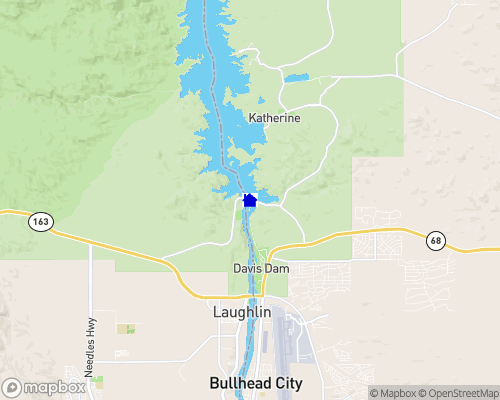 Docking facilities for public use are located at Katherine's Landing, in Arizona near Davis Dam, and at Cottonwood Cove, east of Searchlight, Nevada. Boats and jet skis can be rented at Katherine's Landing.